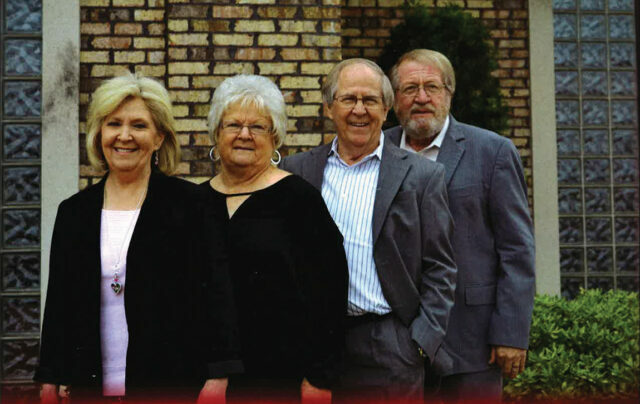 GRAPELAND – The Southern Gospel family quartet The Bolins from Crossett, Ark. are making a return trip to the Grapeland and Crockett area to perform this weekend at two local churches. The Bolins performed for the first time in Grapeland in January 2018 and were well received, prompting an invitation to perform again this year. The Bolins will be in concert at 7 p.m. Saturday, March 23 at Porter Springs Baptist Church in Crockett. The Bolins also will perform at 6 p.m. Sunday, March 24 at Grapeland Baptist Church. Grapeland resident Bill Chavis, who at one time lived and worked in the Crossett, Ark. area, attended a church homecoming service in 2017 in Crossett and heard The Bolins perform. “He told us ‘you gotta come sing at our church,’” The Bolins quartet member Billy Bolin said during a phone interview with The Messenger on Tuesday, March 19. Even though Grapeland is roughly 300 miles away, The Bolins decided to make the trip to Texas to perform. “The people we met in Grapeland were super nice. There were even a few people living there (in Grapeland) from our town,” Bolin recalled. The Bolins quartet consists of brothers Billy Bolin and Sammy Bolin and sisters Sandra Rice and Donna Riley. The siblings have been singing together off and on since they were children – for more than 60 years. The Bolins credit being raised by Christian parents Eddie and Ruth Bolin for their interest in singing Southern gospel. Their musically-inclined father taught them to sing harmony as well as how to play the mandolin and guitar. In 1958, the Bolin Children Quartet (the group’s name during their childhood) sang at the Arkansas State Singing Convention, which was headlined by the world-famous Chuck Wagon Gang. “We were asked to sing during the intermission and that’s always been one of the highlights of our lives,” Bolin said. The Bolins sang together until the mid-1960s until brothers Billy and Sammy were called into military service during the Vietnam War. “In 1978, we started back as a family group with our dad,” Bolin said. Eventually, the group disbanded as the family had various obligations and members moved to different locations. The quartet regrouped in the last eight years and began performing again. During concerts, the quartet performs songs and each member shares their testimony. “We have a chance to witness what the Lord has done for us,” Bolin said. “No matter who sings that song (“When I Knelt, The Blood Fell”), it’s powerful because of the lyrics and the message,” Bolin said. The Bolins are looking forward to meeting those who attend the concerts at Porter Springs Baptist Church and Grapeland Baptist Church. “We enjoyed it so much when we came last year, so we were excited to be asked back,” Bolin said. Porter Springs Baptist Church is located at 161 County Road 3070 at FM 132, six miles west of Crockett. Grapeland Baptist Church is located at the corner of Spivey Road and FM 227, one block east of the U.S. 287 bypass in Grapeland. The public is invited to attend the concerts. A free-will offering will be taken.